View of Santiago from Cerro San Cristobal. We took TurBus from La Serena to Santiago. The trip was about five hours and cost CLP8000/$17. It was amazing how similar Santiago seemed to Toronto on the drive in on the highway through the outskirts. 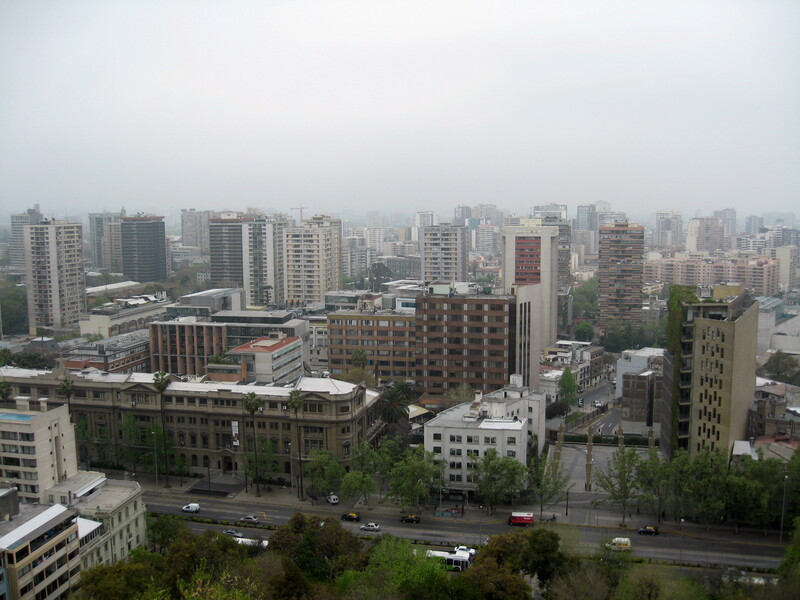 We had read some negative things about Santiago, particularly about the pollution problem. Unfortunately, in the winter months a thick layer of smog drapes the city creating scenes like this. Upon arrival at Santiago’s main bus terminal, we were surprised. It didn’t feel like a major city. There was an entrance to the Metro steps from where we alighted from the bus. We took the red line straight to our hostel: Santa Lucia Green House. We had a double room with cable TV, shared bathroom, shared kitchen, wi-fi, and breakfast for CLP12,300/$25.50 per night. The owners were helpful and cared a lot about their hostel. The first night we were the only guests, so it was almost like we had a private apartment to ourselves (the beauty of traveling in the low season). 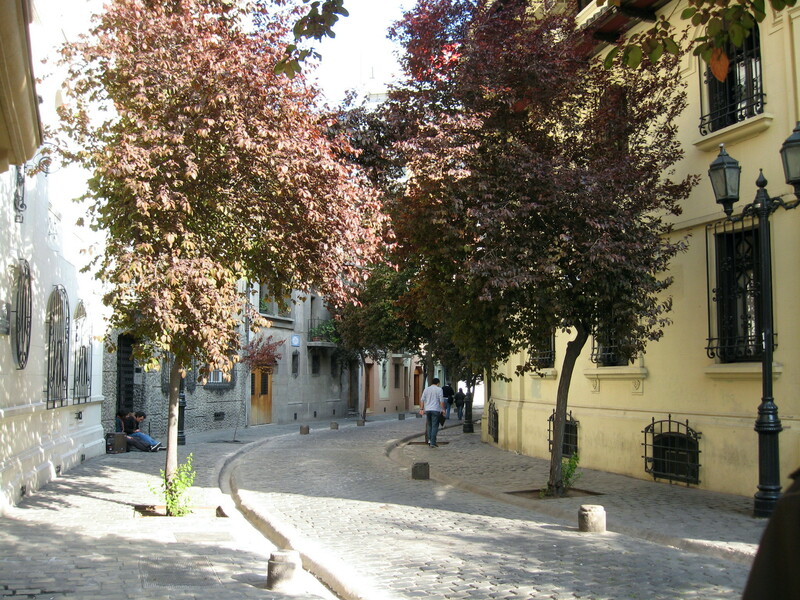 We did our usual self-made walking tour to get a feel of the city. 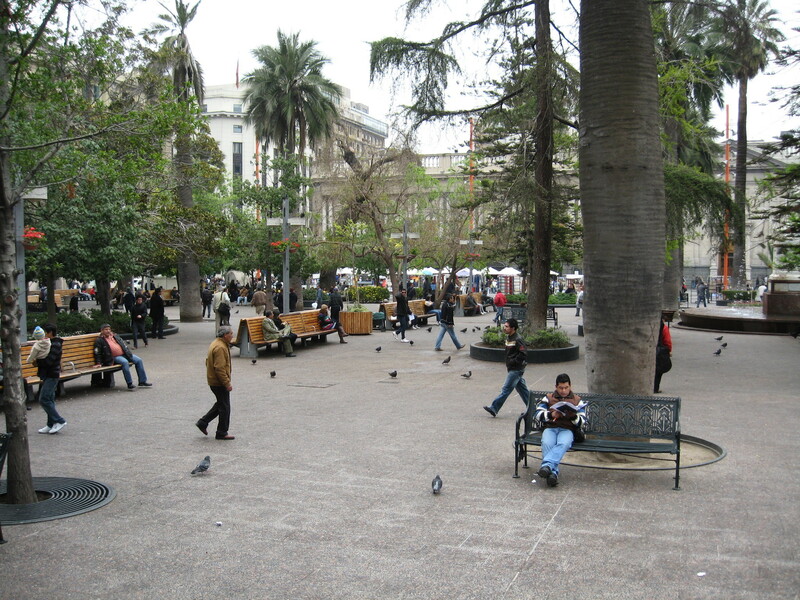 The highlight of which could be the grand Plaza de Armas where you can sit and people watch on the comfortable benches while old men play chess beside you. 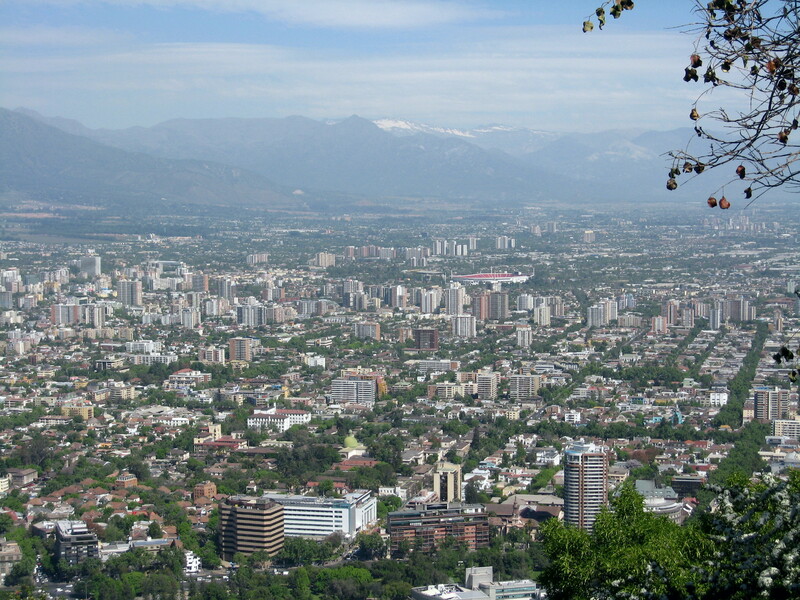 We climbed up Cerro Santa Lucia as the view of Santiago is supposed to be quite nice. It was a grey and rainy day but it was worth it. Some days later we took a picnic up Cerro San Cristobal on a much sunnier day, and we were lucky enough to get a view of the mountains (see above)! Despite the rainy day, we still enjoyed the view from the top of Cerro Santa Lucia. Santiago did feel like a less edgy version of Toronto. Being foodies, we found that it didn’t seem to have an interesting enough restaurant scene. We walked many a block in search of good food and while the fast-food chain restaurants are replete across the city, a decent meal seemed hard to find. The traditional and popular “completos” (hot dogs smothered in avocado) are on every corner. Delicious but not something you want to eat everyday. 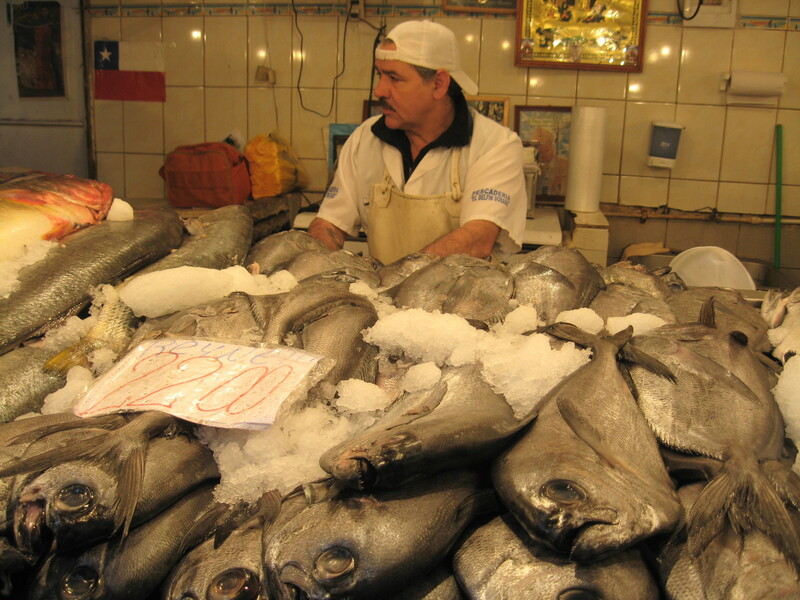 It wasn’t until the third or fourth day that we discovered the best way to eat in Santiago — the markets. The restaurants in the Mercado Central are for tourists and are overpriced, but the actual market vendors selling the freshest of fish and the perfectly ripe avocados are surprisingly cheap and delicious if you know your way around the kitchen. We picked out the ugliest fish we could find (the uglier, the tastier and the less guilty you feel about eating it) and had the fishmonger filet it for us. We battered and fried it in the hostel’s kitchen with a bit of mashed potatoes and some greens. It turned out beautifully, melting in our mouths and satisfying our stomachs. In the area we stayed, Santa Lucia, the cafe culture/artsy areas are being developed and when choosing a cafe it was fairly common to see groups of art students drawing the passersby. The coffee is good and the people watching is plentiful. 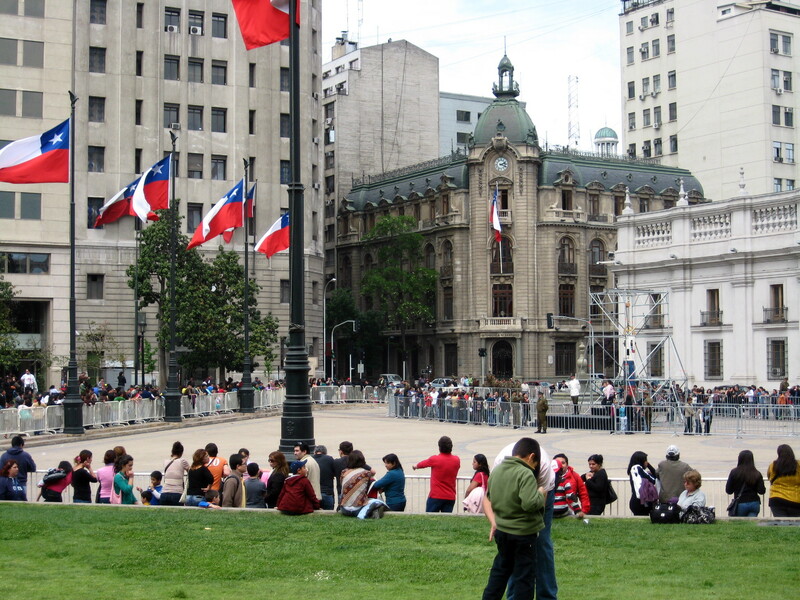 Locals line up to have their photo taken with the pod that rescued the Chilean miners. I just bought my ticket there! The Paris-Londres neighborhood looks beautiful. Good tips about the market.